About the Book You Through Your Dreams is a comprehensive and visionary interpretation of dream symbolisms presented in a practical dictionary format and provides a fascinating view into the mysterious realm of dreams. What does it mean to dream of murky water? Does a coffin symbolism portend the death of the dreamer, or of a loved one? What about a recurring dream in which disaster strikes? How can one avoid accidents shown in dreams? This book, which took over 11 years to complete, offers answers; it offers you and future generations guidance, comfort, and inspiration. It is a light which will reveal you through your dreams. Paul Edward Napora, the author of many well-received books, including The Teachings of Oscar Camille (Volume 1 & 2), is a well-known and gifted mystic. He has assisted people world-wide through interpreting the symbols he sees in their auras and through direct communication with his Cosmic Guide, Oscar Camille. 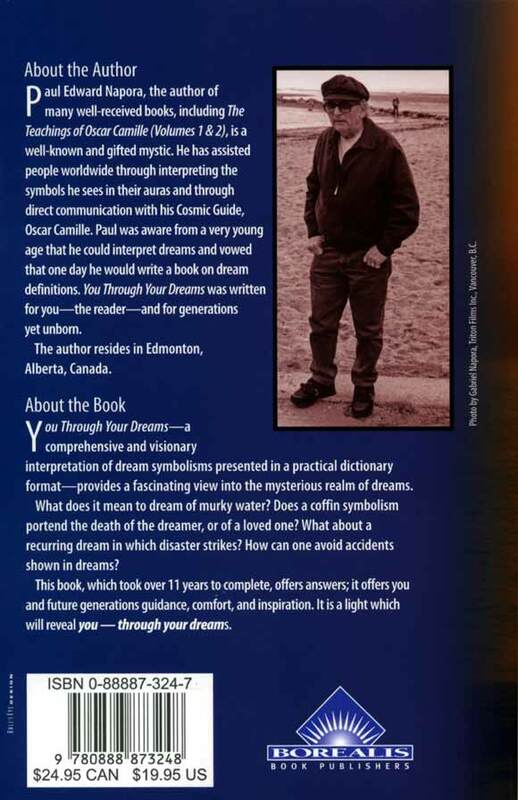 Paul was aware from a very young age that he could interpret dreams and vowed that one day he would write a book on dream definitions. You Through Your Dreams was written for you—the reader—and for generations yet unborn. The author resides in Edmonton, Alberta, Canada.